iPhone versions of desktop apps were all the rage at Macworld Expo—Marketcircle’s Daylite, ProjectWizards’ Merlin, and Quicken.com are among the products soon to be available in iPhone form. Add iSale from Equinux to that mix. Only in this case, the mobile version of the auction management app is now available from the App Store. iSale mobile lets you create online auction drafts on the go. You can pick from among 222 iSale templates, write a description for your auction item, and set the starting price, auction duration, and category. When you’re back near your Mac (and the desktop version of iSale), you can transfer all that data via WLAN. The iPhone app is free, but it requires iSale 5.5, which costs $40. (Equinux offers a trial version that lets you try out three free auctions.) iSale mobile works with both the iPhone and the iPod touch. Health Cubby , from App Cubby: The $5 fitness app lets you set fitness goals and track your progress meeting them; you can also sync with friends to share fitness goals. Baby’s First Piano , from Z Enterprises: The $1 program turns your iPhone or iPod touch into a virtual toy piano for children. Wellness , from Alakoa: The free app offers a database of nutrition data for more than 7,400 foods. myKids , from Goce Petrovski: The $4 app keeps records of kids’ meds, vaccinations, allergies, and doctor visits. PicTricks , from Ziconic: The $2 image-editing app lets you add wacky effects to friends’ photos. 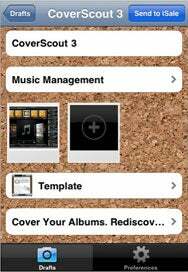 AirFloppy , from Headlight Software: The $1 storage app lets you save, share, and view files on an iPhone or iPod touch. Reflections , from Orange Petal: The $4 Flickr client lets you find photos as well as upload and edit your own images using the online photo-sharing site. Events , from Petr Jankuj: The $3 organizer tracks birthdays, anniversaries, and holidays by day and month.